I'm a huge Gooseberry Patch Fan. The company recently announced that they were no longer going to have a catalog. This has put a lot of women in a bad mood!! The Company wants to focus on Cookbooks. Many of us already support their cookbooks and look forward in seeing all the new releases! Here is their recipe of the week, 7-Veggie Slow-Cooker Stew! It is from their new cookbook, Farmers Market Favorites. Right now they have a special going on with this book. IF you buy the cookbook it will be autographed! How fun! This one is on my wish list! This book is 224 pages and the Chapters include Sunny Starters, Farm Kitchen Snacks, A Basket of Main Dishes, Sprouting Salads, Fresh Soups & Breads, Summer-Thyme Sandwiches and Fresh Baked Desserts. If you make this let me know how it turned out. I'm going to make it in 2 weeks for our Wednesday Potluck at Church. Combine all ingredients in a slow cooker Cover and cook on low setting for 8 to 10 hours, or until vegetables are tender. Serves 10. Thanks for linking up at Friday Follow! I am going down the list, so here I am...your newest blog follower. Hi Kathy! Thanks for stopping by! I'm on my way to visit you! Thanks Lynn for stopping in and following my blog!! I'm doing the same for you! I am a big fan of Gooseberry Patch too! I love the aprons. 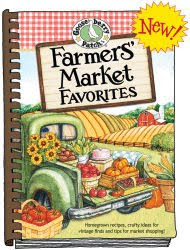 Thanks for your kind review of Farmers' Market Favorites and for sharing our yummy recipe here! I made this tonight and it was over the top amazing! I served it with rice and even my two-year-old gobbled it up. Thanks for sharing!